NUI is delighted to offer for competition in 2018 the NUI Dr Garret FitzGerald Post-Doctoral Fellowship in the Social Sciences 2018. The fellowship is used to provide research support for the NUI Education and Society Committee. The one-year fellowship (with the possibility of an extension to two years) is valued at €40,000 (p.a. ), and will be offered for competition to NUI graduates conducting research under the broad heading of "The Irish University in the 21st century”. While the NUI Education and Society would be pleased to receive a wide range of proposals within this broad heading, a number of sub-themes are being promoted as research areas of particular interest. For more details visit the main awards page. 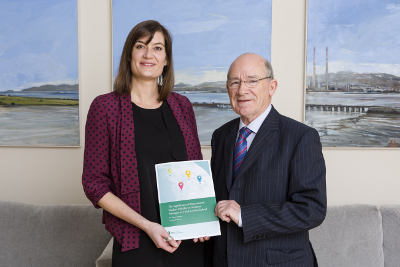 Dr Aline Courtois was the 2014 recipient of the NUI Dr Garret FitzGerald Post-Doctoral Fellowship in the Social Sciences. She undertook her research on International Student Mobility in 2015/2016. NUI held a Seminar on 5 December 2017 to showcase Dr Courtois’ research entitled “The Significance of International Student Mobility in Students’ Strategies at Third Level in Ireland”. The paper addresses the lack of research on the experiences of Irish students engaging in short-term mobility for study and examines the benefits of student mobility at individual, institutional, national and regional levels within the context of HEI’s strategies on internationalisation. in the NUI offices in Merrion Square, Dublin 2. The closing date for applications is Friday, 6 July 2018. The application form and regulations can be found here. For more information contact awards@nui.ie.